Enjoy our newest split level acquisition with spectacular views of the city and the sierras through picture windows from almost any room in the home. This home is conveniently located within four miles of the Reno convention center, Atlantis and Peppermill hotel/casinos and Reno's downtown entertainment district! Our Whistlewood home has a large living room with cozy fireplace located off of the gourmet kitchen and spectacular views of the city and the sierras. Our gourmet kitchen has granite counters and island with wine cabinet, double door refrigerator, dishwasher, assorted small appliances and is fully furnished to serve groups as large as sixteen. This home has large dining that seats up to eight in the front bay window and a second dining for six off of the kitchen. The family room has similar views through picture windows with cozy fireplace and built in bar, professional pool table, built in bar and wine cooler and sleeper sofa to equip this room as a fifth bedroom. Our Whistlewood home has four plus bedrooms all with their own tv's beginning with the upstairs Master bedroom with king bed and attached bath with tile counters and separate tub and shower. The second upstairs master bedroom has a queen bed with nearby bathroom. Downstairs are two additional bedrooms with a Queen bed in one and two twin/twin bunkbeds in the other with two bathrooms nearby. Two additional high end air beds are available upon request for larger groups. Whistlewood has a fully furnished laundry room located downstairs and all of our homes have wi-fi for your enjoyment. Whistlewood sits on a half acre lot with private fenced back yard with garden patio, outdoor firepit, and gas barbecue for your enjoyment! Whistlewood prices at $450 per night, $2500 per week or $5400 per month plus tax and cleaning with a standard three day minimum. Prices and minimum stays are subject to change and longer minimums for special events and holidays. 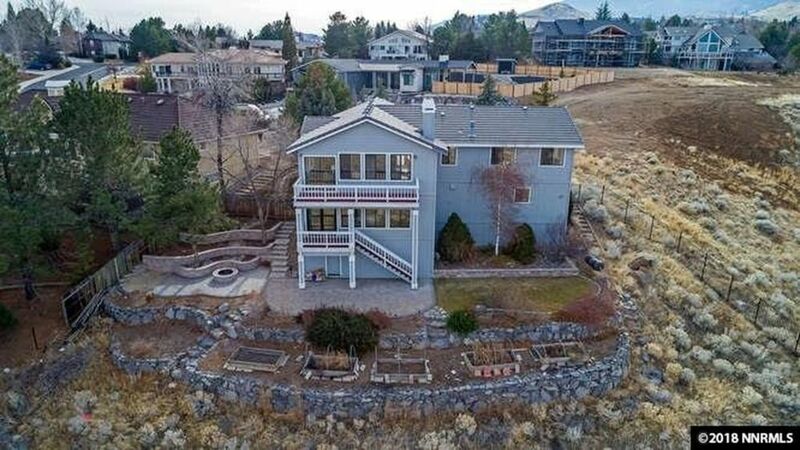 We searched for this property for for months looking for a luxury home with mountain and city views within four miles of the Reno convention center and downtown entertainment district. We believe you will agree this home has everything we were searching for and much more! Gourmet kitchen with double door refrigerator-dishwasher and microwave with separate dining for six fully equipped to serve groups as large as sixteen! The property was in a prime neighborhood and location, just a couple of easy miles from the major Casinos. The house was very comfortable for the 12 of us, especially the large dinning room table and the game room, and beautifully furnished and decorated. The kitchen was fully stocked with everything we needed, including coffee. Bedrooms quite adequate and comfortable. One disappointment was with the back yard. I specifically asked if it was a wood or gas fired Fire Pit, and got the reply that it was wood fired but that they were going to convert it to gas. I then asked if firewood was provided, and got a negative response. We therefore hauled 3 nights of firewood with us and were very fortunate to have good weather, and looked forward BBQ-ing and dinning out on the patio in front of a roaring fire. Turns out they had just started the gas conversion and the pit was unusable with wood. We were informed that their Maintenance Man would see if either the conversion could be completed, or the gas fixture removed for wood use. Unfortunately we never heard back and were forced to take all our meals inside, and were unable to enjoy the cold nights in the back yard. Just as well maybe, as the BBQ was filthy and I was not interested in cleaning up after someone else. Our only other disappointment was with the TV's. There were plenty of them, in the bedrooms and exceptionally large ones in the Living room and Game room, but we were never able to get the one in the game room to work. All TV's had 2 to 3 remotes, and with 5 kids we ended up spending a considerable amount of time trying to keep them working, even with 7 adults very familiar, of course, with the issues involved. We suggest getting Universal Remotes, one for each set, to avoid the frustration. THANK YOU FOR YOUR INPUT, IT HAS BEEN INSTRUMENTAL IN UPDATING POLICY. WE HAVE NEVER HAD AN ISSUE WITH PLACEMENT OF GARBAGE CANS IN FRONT OF A NEIGHBOR'S HOUSE UNTIL NOW BUT TO AVOID THIS IN THE FUTURE WE WILL INSTRUCT OUR GUESTS TO PUT TRASH CANS NEAR THE OPEN FIELD WHEN MEETING THEM ON ARRIVAL. THE CARPET YOU REFER TO IS ONE OF THOSE OPEN WEAVE CARPETS WHICH LOOKS GREAT BUT PIECES OF CARPET WILL COME LOOSE WHEN VACUUMED. I HAVE INSTRUCTED MANDY TO EMPTY THE VACUUM COMPLETELY AFTER CLEANING. WE HAVE NEVER HAD AN ISSUE WITH THIS CARPET UNTIL NOW BUT IF WE HAVE ANOTHER WE WILL REPLACE IT. AS FAR AS SOAP IS CONCERNED OUR CUSTOMERS PREFER THE SANITIZED BOTTLES AND SO WE WILL KEEP THEM. WE HAVE THEM AT ALL EIGHT HOMES WITHOUT ISSUE. WE DO HAVE ONE TV REMOTE PROGRAMMED FOR EACH TV AND GERNERALLY TURN EACH ON UPON CUSTOMER ARRIVAL AND LET OUR GUESTS KNOW THIS PARTICULAR REMOTE IS PROGRAMMED FOR THIS PARTICULAR TV. WE ARE PLANNING TO PUT STICKERS ON EACH TO DESIGNATE THE TV EACH IS PROGRAMMED TO. IN THE BACK YARD WE HAVE A GAS BARBECUE GRILL AND DINING FOR EIGHT WHICH WORK JUST FINE. WE ARE CONVERTING THE FIRE PIT TO GAS TO REDUCE THE MESS AND THE GAS LINE IS RUN BUT WE ARE AWAITING PARTS. THE FIREPLACE UPSTAIRS WORKS ON A PUSH BUTTON BUT ARE AWAITING PARTS FOR THE ONE DOWNSTAIRS. YOUR SECURITY DEPOSIT IS COLLECTED AND RETURNED BY VRBO WITHIN SEVEN TO TEN WORKING DAYS UNLESS THE OWNER FILES FOR DAMAGE. IN TEN YEARS IN THE BUSINESS WE HAVE NEVER FILED WITH VRBO FOR DAMAGE. This house has amazing views. The beds were very comfortable. We the layout of the house is great, there is room for everyone to have privacy. Rick Strode was very easy to work with, and really accommodated our schedule. We would definitely book again. THANK YOU FOR TAKING THE TIME TO WRITE A REVIEW FOR OUR WHISTLEWOOD HOME. WE HAVE SEVERAL HOMES THAT WE ARE WORKING WITH AND OUR WHISTLEWOOD HOME IS ONE OF THE FEW LUXURY HOMES AVAILABLE IN RENO. The best Reno has to offer!!! There are so many wonderful reasons why this should be your first and only consideration for a vacation rental in Reno. Rick and Mandy are an absolute dream to work with during the whole process. Many vacation rentals have a firm set of rules and cleaning that needs to be taken care during your stay. Our check-in and check-out was a breeze and they were accommodating and flexible. The house was absolutely gorgeous. Usually, in mountain towns, you get stuck on a hard spring mattress from 20 years ago but all the beds in the house had upgraded memory foam making all your guests feel rested and comfortable. Aside from the luxury within the house, you get breathtaking views of the mountains and you are a short uber/lyft to downtown areas. The raley's nearby has all the yummy snacks and food you could possibly need for your stay as well. We would love to come back and visit with any of our friends for a relaxing weekend getaway in the future. I highly recommend staying at any one of Rick's amazing properties. When it comes to hospitality and customer service you can tell how serious they take there guests. Enjoy your future stay! IT WAS A PLEASURE HAVING YOUR FAMILY STAY WITH US AND I'M VERY PLEASED THAT EVERYONE ENJOYED OUR HOME IN RENO. RENO ONLY HAS ABOUT 60 VACATION HOMES LISTED AND FEW ARE "LUXUY HOMES" BUT WE ARE WORKING WITH SEVERAL AND FOUR OF THOSE ARE LUXURY HOMES LIKE THE WHISTLEWOOD HOME AND WE ARE PLEASED THAT YOUR EXPERIENCE WAS SO POSITIVE'. HERE'S HOPING FOR A SPEEDY RECOVERY FOR YOUR SON FROM SURGERY AND THAT YOU WILL BE ABLE TO RETURN TO RENO AND WATCH HIM PLAY FOR UNR NEXT SEASON! KEEP US IN MIND FOR YOUR NEXT TRIP TO RENO!